At Floyd’s Welding Service, our single drum pulling units are used in the oil industry to pull rod & tubing. Our rigs are completely rebuilt by highly experienced employees, with quality materials and brands. 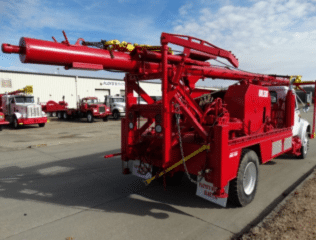 Some important features of our single drum pulling units include: air clutch on jack shaft, keeping the cost down and making repairs easier, also do clutch in drum; rear Rexroth air control valves & control panel overhead; and, 1/2″ seamless pipe poles 10″ and 13″. Not only do we sell completely refurbished rigs, we can also conduct any repair, troubleshooting or refurbishing you would need on your existing rig. Floyd’s Welding is completely tooled up to perform any repair or replacement you may need. We have the capability to both go on site to rig locations and do mobile welding and work, and have a large factory for larger, more complex work. Simple problems can be easily identified when we go on location and troubleshoot rigs while running, working directly with those who operate the rigs. We inspect rigs in shop, and perform service, oil changes & complete greasing of unit. Facelifts and reconditioning of units is also within our scope. We stock a large supply of rig parts, so we’re ready to get you moving again when you’re broke down. We also have an extensive network of vendors to quickly supply any parts not currently in stock. Turn Drums up to 42″ O.D. 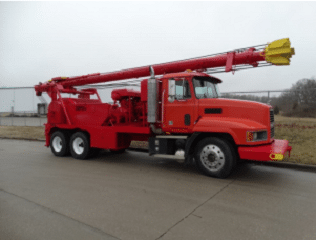 Floyd's Welding Services provides oil well pulling unit repair and welding services to Olney, Vincennes, Effingham, Salem, Fairfield, Louisville, St. Elmo, Griffin, Crossville, and surrounding IL and IN communities.